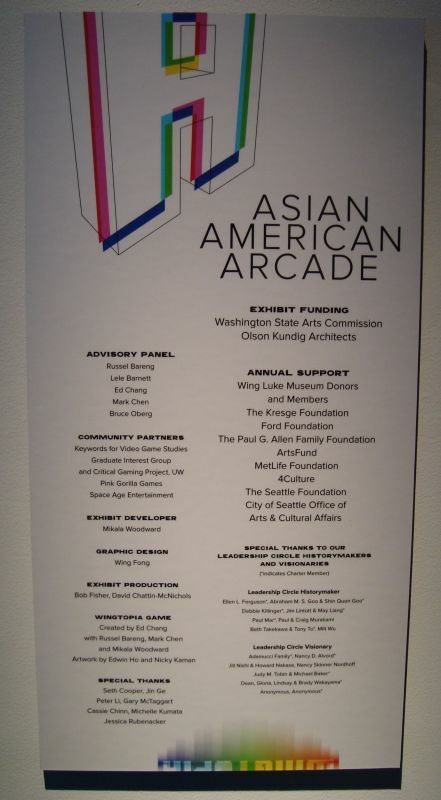 Over the weekend, I got a chance to head down to the Wing Luke Museum for the Asian American Pacific Experience to see the Asian American Arcade exhibit. Unfortunately, because of a snafu, I was not able to attend the opening reception. But I still wanted to see the completed space and to get a chance to walk through as a visitor. What does it mean to think about video games and Asian American experience? 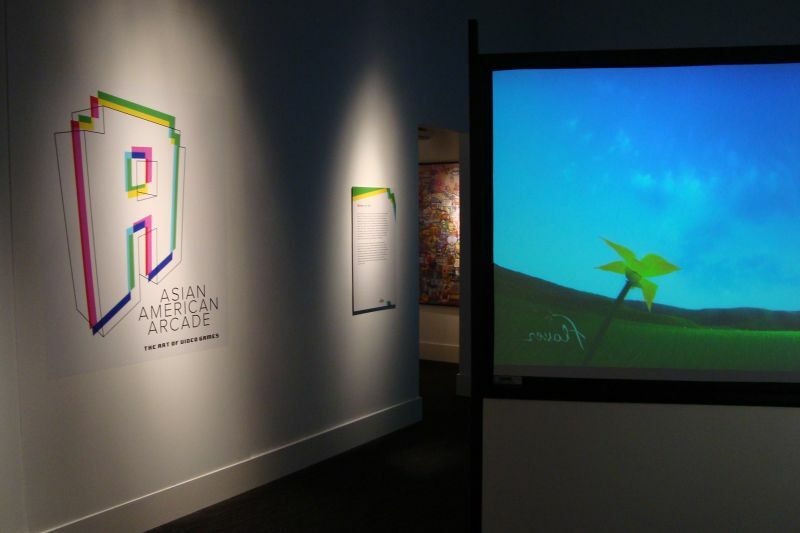 Is this an exhibit of Asian American artists and game designers? Is this about games about or with Asian American content? And, perhaps most importantly, why devote time and space to games in the first place? As a result, the exhibit gathered an array of pieces from an vintage Pac-Man arcade machine to drawing and painting to digital art to an array of games including Jenova Chen’s Flower and Peter Brinson and Kurosh ValaNejad’s Cat and the Coup. Welcome! On your journey through the land of Wingtopia, you will encounter mysterious creatures and unusual people. You will investigate strange sights and sounds. You will be called to solve riddles and perform great feats. And you will discover that what you say, think, and do will determine your life’s path. Ready to play? Choose a character card to begin. MEI MEI: a bubbly, bubble-gum chewing, pink-haired, pig-tailed school girl with amazing powers and pretty skirts. BLOSSOM LOTUS: a raven-haired, porcelain-faced woman wearing a kimono and carrying a fan, who walks with great poise and femininity. ZIRO: a nimble, leather-clad, very cool young man with gravity-defying hair. Rides a supersick motorcycle. Armed with shiny throwing stars, nunchakus, and a katana. S.W.O.R.D. : Strategic Weapon of Robotic Defense or SWORD is a robot with big legs and arms made from a shiny, unidentifiable metal. A jet pack, currently nonfunctional, is on its back. GUMMY: An old man with long gray hair and beard, wearing wooden sandals and a simple brown robe tied with a piece of frayed rope. Smells of tea and feet. I am happy and proud. Even though I did very little of the heavy lifting, the whole experience has been incredible and educational. I hope that the exhibit is well-received, and I hope that people enjoy playing the gallery game. Once again, I’d like to thank the Wing Luke Museum, the Exhibit Developer Mikala Woodward, the Community Advisory Panel, and all of the artists and supporters for the amazing experience seeing a exhibit come together from start to finish. 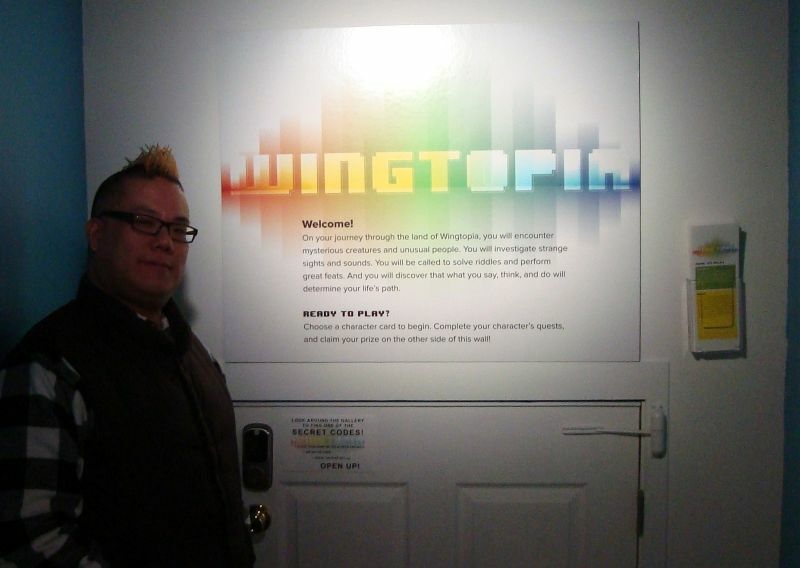 This entry was posted in Commentary, Gaming, Writing and tagged Asian American Arcade, Wing Luke Museum, Wingtopia gallery game. Bookmark the permalink. 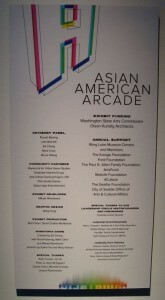 I attended the Asian American Arcade Exhibit recently during my first trip to the Wing Luke Museum. I was pleasantly surprised when I realized it was a free admission day but then I realized everyone and their family had decided to attend the museum that day. Don’t get me wrong, I love to see museums buzzing with life; I prefer attending museums when there aren’t many people and I have more space to move around and not feel rushed or squished with the people around me. However, when I visited the Arcade exhibit, I was able to see a few groups of people interacting with the various displays/games. The whole time I was in the room an older couple had claimed the Pac-Man game and would not give it up. At all. I kind of thought that was interesting, because even if you can’t play the game you get the feel that you’re in an arcade, waiting for the person’s in life before you quarters to run out. I felt an actual arcade or more of a community feel than other exhibits I’ve attended when I played the Cat and the Coup. A group gathered around me as I played and helped me figure out which piece of furniture I should interact with. It was quite entertaining. I walked by Wingtopia a few times and the first time a group of about 5 or 6 twelve year old girls was there. My mom asked one of them what they were doing. The girl that answered was SO excited to show her that she had found the code to open the door and her friends were all inside. By the time I wandered by it again, another group was there and I didn’t feel like interrupting them. Although I was able to see people of all ages interacting with the displays, I would like to return again. Maybe next time I’ll bring my own group of people and we can claim Wingtopia for a while and I can get a feel for the game play itself. 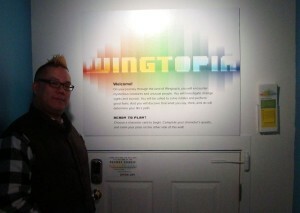 Overall it was a very interesting trip and I definitely recommend checking out all the exhibits in the Wing Luke.